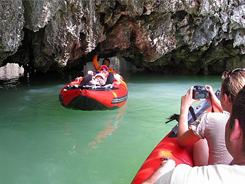 This amazing day out in Phang Nga by speedboat takes you to see some spectacular islands and gives you the opportunity to try sea canoeing at the magnificent Hong Island cave. You will be delighted with the delicious lunch cooked by local sea gypsies. 07.30 - 08.30 Pick up from ypur hotel and transfer to Ao Por Pier. 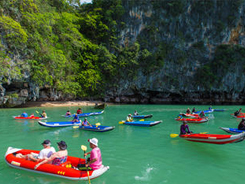 10.00 Depart from Ao Por Pier to Phang Nga Bay by speed boat. 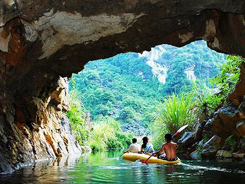 11.00 Enjoy canoeing to enter the cave at "Hong Island" . 12.00 Sightseeing and amazing in rock shape looks like Scoopy Doo. 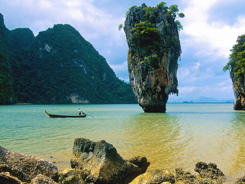 13.50 Visit James Bond Island & Khao Ping Kan.
14.30 Explore Ice Cream Cave. 15.00 Arrive at Naka Island for Swimmong & Relexing. 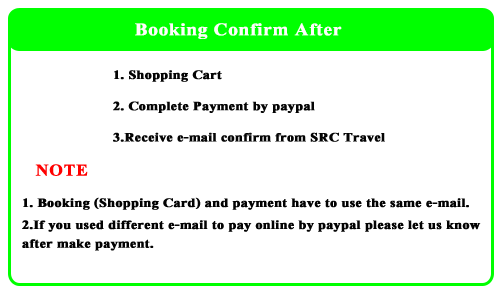 16.00 Arrival time to "Ao Por Pier".